You can store data for your mobile application in a Cloudant database. Cloudant is an advanced NoSQL database that can handle a wide variety of data types, such as JSON, full-text, and geospatial data. The SDK is available for Java™ , Objective-C, and Swift. CloudantToolkit and IMFData frameworks are discontinued in IBM Mobile Foundation v8.0. For iOS, use the CDTDatastore SDK as a replacement for CloudantToolkit and IMFData frameworks. For Android, Use the Cloudant Sync Android SDK as a replacement for CloudantToolkit and IMFData frameworks. With Cloudant Sync, you can persist data locally and replicate with a remote data store. If you want to access remote stores directly, use REST calls in your application and refer to the Cloudant API Reference. When you are storing data on the mobile device that must be stored in a FIPS 140-2 compliant manner. When you need to synchronize data between the device and the enterprise. When you are developing a hybrid application. For more information about JSONStore, see JSONStore. To download the sample, see Sample: mfp-bluelist-on-premises. To understand the adapter that is included with the Bluelist sample, you must understand both Cloudant security and MobileFirst security framework. Perform the required admin requests to Cloudant from the Bluelist sample. The sample demonstrates how to perform API requests that require admin access on the server where it is secure. While it is possible to place your admin credentials on the mobile device, it is a better practice to restrict access from mobile devices. The Bluelist sample integrates MobileFirst security with Cloudant security. The adapter sample maps a MobileFirst identity to a Cloudant identity. The mobile device receives a Cloudant session cookie to perform non-admin API requests. The sample uses the Couch Security model. The following diagram illustrates the integration performed by the Bluelist adapter sample /enroll endpoint. Mobile device obtains the MobileFirst OAuth token from the MobileFirst Server. Mobile device calls the /enroll endpoint on the adapter. The adapter sample validates the MobileFirst OAuth token with the MobileFirst Server. If valid, performs admin API requests to Cloudant . The sample checks for an existing Cloudant user in the _users database. If the user exists, look up Cloudant user credentials in the _users database. If a new user is passed, use the Cloudant admin credentials, create a new Cloudant user and store in the _users database. Generate a unique database name for the user and create a remote database on Cloudant with that name. Give the Cloudant user permissions to read/write the newly created database. Create the required indexes for the Bluelist application. Request a new Cloudant session cookie. The adapter sample returns a Cloudant session cookie, remote database name, and Cloudant URL to the mobile device. 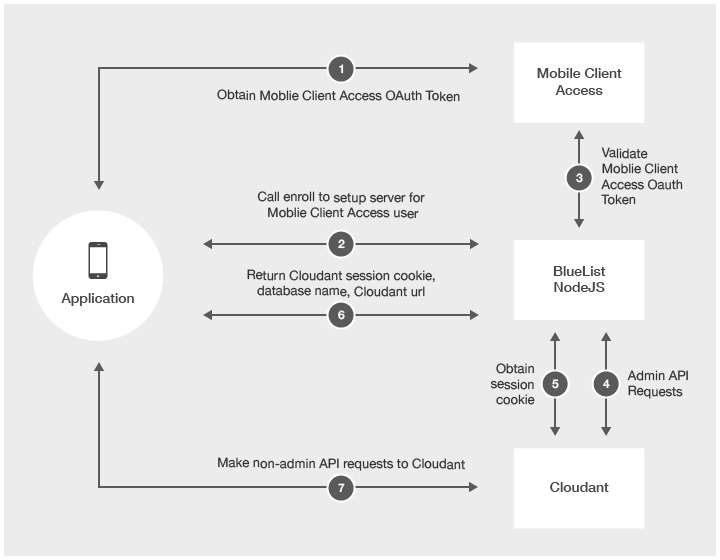 Mobile device makes requests directly to Cloudant until the session cookie expires. In the case of an expired session cookie, the mobile device can exchange a valid MobileFirst OAuth token for a Cloudant session cookie with the /sessioncookie endpoint. You can use a local data store to store data on the client device for fast access, even when offline. To create Store objects to access a local database, supply a name for the data store. Important: The database name must be in lowercase. To save data in the remote store, supply the data store name. To enable the encryption of local data stores on mobile devices, you must make updates to your application to include encryption capabilities and create encrypted data stores. Obtain the encryption capabilities with CocoaPods. For more information, see the CDTDatastore encryption documentation. Run the following command to add the dependencies to your application. Initialize your local store for encryption with a key provider. Warning: If you change the password after creating the database, an error occurs because the existing database cannot be decrypted. You cannot change your password after the database has been encrypted. You must delete the database to change passwords. When you are replicating data with an encrypted local store, you must initialize the CDTPullReplication and CDTPushReplication methods with a key provider. Replication with an encrypted database requires no changes from replication with an unencrypted database. To encrypt data on an Android device, obtain encryption capabilities by including the correct libraries in your application. Then, you can initialize your local store for encryption and replicate data. Add libraries. Add the shared library files and SQLCipher archive to the jniLibs folder under your Android app directory. Add the required ICU compressed file to the assets folder in your app. Add sqlcipher.jar as a file dependency. From the app folder menu in Android studio, select the Dependencies tab under Open Module Settings. Warning: If you change the password after you create the database, an error occurs because the existing database cannot be decrypted. You cannot change your password after the database is encrypted. You must delete the database to change passwords. When you are replicating data with an encrypted local store, you must pass a KeyProvider object into the pullReplicationForStore() or pushReplicationForStore() method. You can set user permissions on remote databases. You cannot set user permissions from the mobile device. You must set permissions with the Cloudant dashboard or server-side code. For a sample of how to integrate MobileFirst OAuth tokens with Cloudant Security, see the Bluelist sample. Cloudant stores data as JSON documents. To store data as objects in your application, use the included data object mapper class that maps native objects to the underlying JSON document format. iOS: Cloudant stores data as JSON documents. The CloudantToolkit framework provided an object mapper to map between native objects and JSON documents. The CDTDatastore API does not provide this feature. The snippets in the following sections demonstrate how to use CDTDatastore objects to accomplish the same operations. Android: AndroidCloudant stores data as JSON documents. The CloudantToolkit API provided an object mapper to map between native objects and JSON documents. Cloudant Sync does not provide this feature. The snippets in the following sections demonstrate how to use DocumentRevision objects to accomplish the same operations. You can modify the content of a data store. For more details on create, retrieve, update, and delete (CRUD) operations, see CDTDatastore CRUD documentation. For create, retrieve, update, and delete (CRUD) operations on a remote store, see the Cloudant Document API. To delete an object, pass the object that you want to delete to the store. To perform queries, you must create an index. iOS: For more details, see CDTDatastore Query documentation. For query operations on a remote store, see the Cloudant Query API. Android: For more details, see Cloudant Sync Query documentation. For CRUD operations on a remote store, see Cloudant’s Query API. Create an index that includes the data type. Indexing with the data type is useful when an object mapper is set on the data store. // A store that has been previously created. // The fields to index. After you create an index, you can query the data in your database. iOS: For more details, see CDTDatastore Query documentation. Android: For more details, see Cloudant Sync Query documentation. For query operations on a remote store, see the Cloudant Query API. // Use result of query. Result will be Automobile objects. To run a query for objects, create a Cloudant query with the query filters on data type. Run the query against a Store object. You can synchronize the data on a mobile device with a remote database instance. You can either pull updates from a remote database to the local database on the mobile device, or push local database updates to a remote database. iOS: For more details, see CDTDatastore Replication documentation. Android For more details, see Cloudant Sync Replication documentation. For CRUD operations on a remote store, see the Cloudant Replication API. // database to the remote datastore.